31476.patch​ (5.3 KB) - added by afercia 4 years ago. 31476.2.patch​ (8.7 KB) - added by afercia 4 years ago. 31476.3.patch​ (10.6 KB) - added by afercia 3 years ago. 31476.diff​ (13.8 KB) - added by afercia 2 years ago. animated-widget-contents-width.mov​ (420.8 KB) - added by westonruter 2 years ago. 31476.2.diff​ (1.5 KB) - added by afercia 2 years ago. 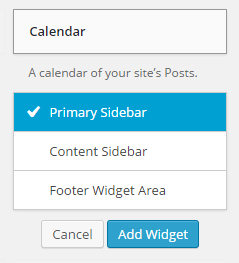 The widget headers themselves are also clickable, and produce a list of clickable list items, intended to allow adding widgets to sidebars without dragging. I can not get to any of this with my keyboard and literally only just found out this functionality exists. I presume they need semantic treatment too, but I'm not entirely sure what to do with them. I'm proceeding file by file, as agreed, though in some cases editing some files requires to change also other files, I would try to be as clean as possible with patches, otherwise we will end up with very big "monster" patches, very difficult to handle. Refreshed patch. Takes care of the buttons in the Customizer too. Also, a better string for translation. In the screenshot below, see the links in question, before and after the patch: they should be buttons. Please notice for a proper styling this patch needs to wait for #34242 and the review of the .button-link style. About the accessibility part, there's a bug in Firefox/NVDA that prevents NVDA to announce the dynamic change of the aria-expanded attribute, see ​http://community.nvda-project.org/ticket/5247. We already faced this bug in the Customizer and the only workaround would be changing the markup. This issue should go in a separate ticket though. Please notice the Delete/Remove button is an edge case and has its own rule for the "red". 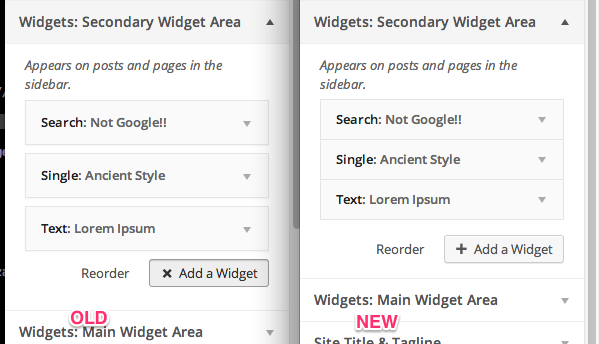 Left: in the Widgets screen, right: in the Widgets panel in the Customizer. Wondering if the .button-link CSS class should provide also the default/hover/active/focus blue colors. @afercia Good question. I'm not sure if it's been discussed elsewhere, but I'd lean toward a yes on this versus trying to implement them every place the link style is used. I'd lean toward a yes on this versus trying to implement them every place the link style is used. I was thinking the same thing, after all if they should look like default links, it would be a bit annoying (and inefficient) having to implement the missing properties in every place. Should we open a separate ticket? To recap: blocked by #35126. Punting, as #35126 was punted too. This ticket was mentioned in ​Slack in #core-customize by afercia. ​View the logs. Note: testing with screen readers, seems NVDA has troubles in announcing the aria-expanded state change when a JS animation is running or a CSS class gets applied on an ancestor element; the order in which DOM changes, JS animations, and the aria-expanded change run, does matter and shouldn't be changed. Added a couple inline comments. There's room for further enhancements, they should go in separate tickets. For example, other elements in the widgets screen are still not fully operable with a keyboard. Also, it would be nice to have a standardized CSS class for the "circular focus". @afercia the added underlines on widget remove is okay I think. 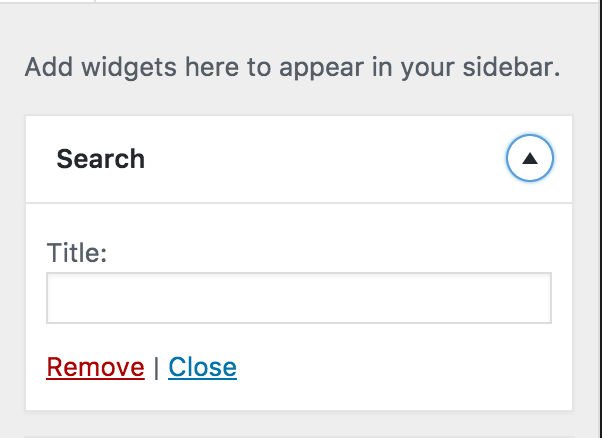 Accessibility: Make some Widgets buttons real buttons. Links used as UI controls that behave like buttons, should be buttons. width while animating. See animated-widget-contents-width.mov​. I say mostly because there is one other oddity in that there is a 1px border at the top of the .widget-inside while animating and then it collapses once the animation finishes. So seems that during the animation, the button exceeding the title height breaks things. However, I'd consider to remove the title height change. Seems this always worked this way and seems intentional (I've also commented in the stylesheet) but it makes things more difficult for a small gain. Thoughts? A wee bit more compact on screens sizes less than 700px tall and more than 981 wide. Compact widget-tops on smaller laptops, but not tablets. 31476.2.diff​ fixes the animation glitch introduced in . Also restores the original design intent. 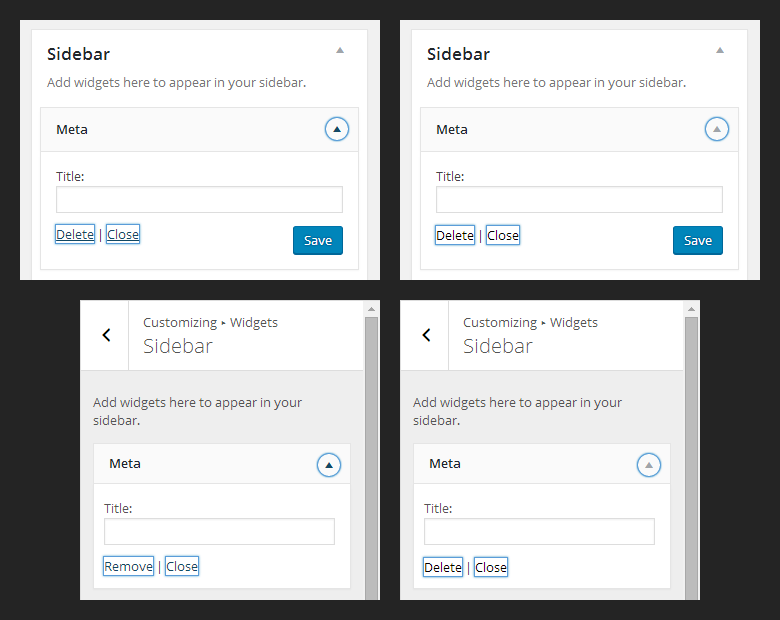 Worth noting the customizer menu items, which are very similar to the widget items, behave differently. It would be nice to introduce some consistency in the future. Customize: Fix a visual glitch on the widget control animation introduced in . on smaller laptops, but not tablets". #40677 was marked as a duplicate. This ticket was mentioned in ​Slack in #accessibility by juliemoynat. ​View the logs.